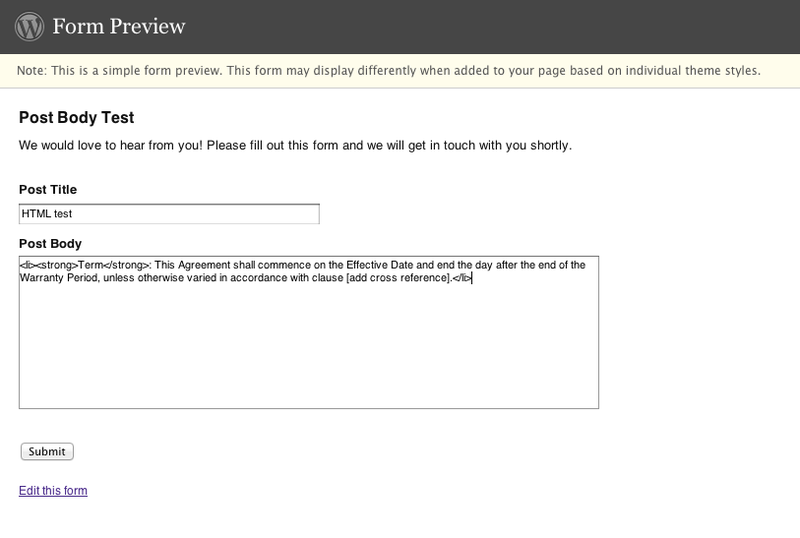 When I try to submit a form with this in the post entry field the form entries just go white and nothing submits. Any ideas what might be causing this please? I'm unable to replicate this using a Post Body field and the data you included above. See screenshots below. The next question would be if you have any custom code in place using hooks that could be impacting the processing. @RichardBest - is this on a multisite installation? Also, does the form submit properly, but the post body is empty? Or are you getting a blank screen like a 500 Internal Server Error? I'm not clear on what "form entries just go white" means exactly. Thanks. Thanks Carl, Chris. I've checked for theme and plugin conflicts but am confident there is none. The problem appears across all 3 themes I have installed, including TwentyTen and TwentyEleven. I've deactivated all other plugins and the problem remains. I'm running the latest release versions of WP and GF. 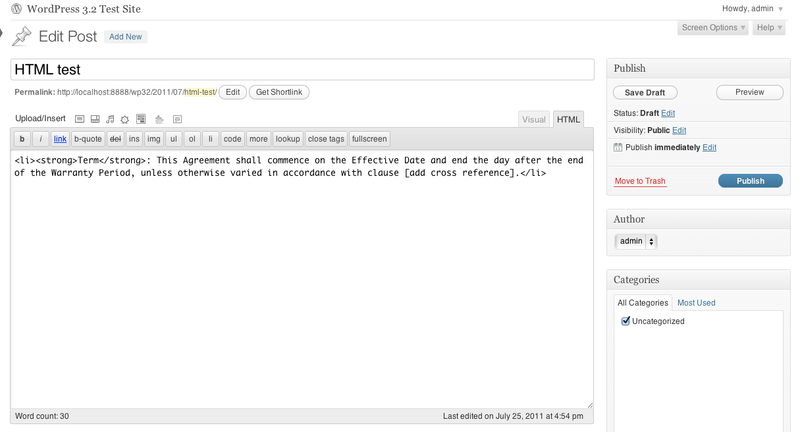 Would you mind trying this code on your site please and letting me know if it submits? Chris, I'm not running multisite. When the form submits, the screen/page simply refreshes as if I'd never submitted anything, i.e., the page and the empty form appear and there's no confirmation message. Hi Richard. Something weird is going on. I pasted in your entry exactly as you posted it here, both times. When using the content template, a whole bunch of extra stuff got added. Not sure if that is causing you a problem, but it was strange to see on my site. I was looking for an option to turn off auto-formatting, like you can when customizing the email notifications, but I could not find it. My functions.php is empty except for a function which applies only to a different form with a gform_post_submission_2 hook. Very weird, although my experience was not the same as yours. Mine submitted fine. Maybe your form is more complex and that's causing problems on the host, with memory or something like that? Or mod_security or SELinux causing trouble? Maybe the list items are a red herring? Can you post a link to the form online on your server, or export the form as XML so we can try it? I see no logical reason as to why that should be the case. I'm stumped. Even weirder that you can't emulate the problem as I have fresh installs of WP and GF. Thanks for any additional thoughts/help. @RichardBest Send us a WordPress admin login for the site AND an FTP login for the site via our Contact Us form and we can do some debugging. Reference this forum post when doing so. We'd have to debug this on your server, neither Chris or I can replicate it locally and we aren't located in the same location or using the same test servers... so it's definitely specific to your server or site. I suspect this is indeed server related. Will now send you the logon and FTP logon.